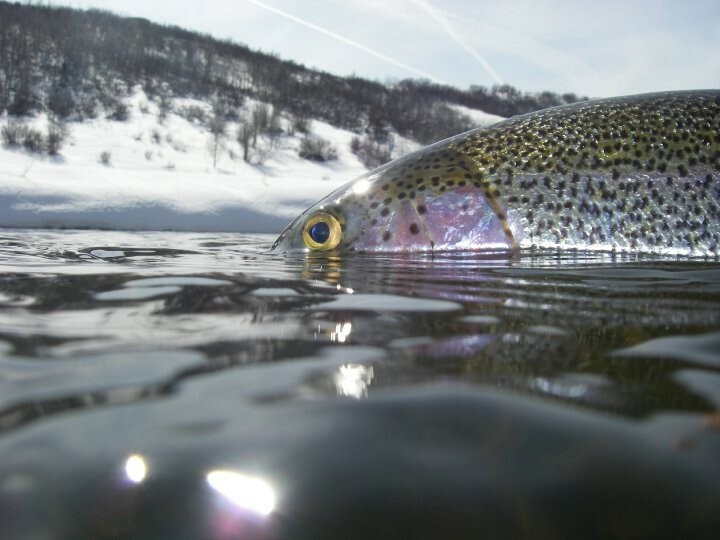 Lakes, ponds and reservoirs hold a lot of big trout and choosing the best stillwater fly patterns can be a challenge for many anglers who normally fish moving water. Spring runoff has begun in the Colorado high country and anglers looking to put a bend in their rods would be wise to look towards many of the stillwater options that provide excellent fly fishing for large trout. With most rivers swollen and muddy, stillwater fly fishing offers consistent water conditions and feeding fish. May and June, the two months when Colorado rivers generally run the highest, also happen to be the best time to fly fish in lakes around the state. Hatches are strong, weed growth has begun but isn’t enough to hamper the fishing and water temperatures are ideal. I probably use some variation of this pattern more than any other nymph pattern while fly fishing in Colorado lakes. Slim, sparse damsel #10-14 nymphs in olive seem to work the best. Damsel fly nymphs are active swimmers and trout are happy to search them out along weed bed and drop offs. Fish damsel fly nymphs deep with slow strips and twitches. This pattern shines as a general searching pattern. It can imitate everything from scuds to mayfly nymphs. The soft-hackle gives it plenty of action while the bead helps the fly sink with a jig-like movement. I’ll often hang this fly a couple of feet behind a larger streamer when trout get a little picky. Sizes #12-18 work well. Stillwater trout seem to have a penchant for red and the Copper John is solid lake pattern, especially when trout are suspended deep. Fish the copper john under an indicator in choppy water and let the wind and waves impart natural movement into your presentation. #14 and #16 are good choices. Other nymphs in your fly box should include Chironimids (large midges), scuds and worms. This is the Royal Wulff attractor of lakes flies. It imitates everything and nothing. Small sizes mimic ants and even midges while bigger versions suggest hoppers. It is also a buoyant pattern that suspends nymphs well. Start at #16 and go up to #6. 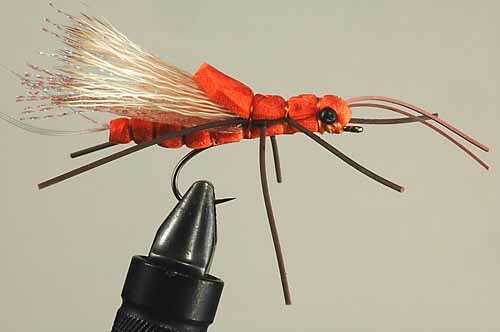 This fly is a great pattern that works well for spookier fish sipping small midges. On stillwaters it floats well but has a subtle profile. The two-tone hackle and peacock herl are natural fish attractors. I prefer small Renegades in #18 and #20. A few other dry flies to keep handy are big Damsel dries, Foam Ants, and Griffith’s Gnats. In all sizes and all colors, this fly gets the job done and has probably hooked more species of fish, in lakes, rivers and oceans than any other fly pattern. Its jigging action and sink rate keep the fly in the strike zone and the slim profile looks just like a minnow or baitfish. For lakes try olive and white or brown and white in #2-6. Keep a few bigger ones around if your lake has some pike! These streamers are hands down my favorite lake searching fly. Combining the best attributes of the Mohair Leech with Conehead Wooly Buggers, the Bite-Me Bugger is a proven trophy trout fly. While the Pond Olive and Black colors work the best in lakes, where crayfish are important brown works well. #2 thru #6 will cover your needs. Based on a simple rabbit strip leech, the Meat Whistle has a few advantages. The jig style hook avoids snags on the bottom and the cone gets it down. Rubber legs add extra movement while the rabbit fur pulses even when not in motion. This is a big fish fly and works great for bass and pike too. Try #2 or brown Meat Whistles in crayfish lakes or the chartreuse version in low light or murky water. Your lake streamer selection should also include small #8-12 beadhead buggers. This spring runoff season, try some of Colorado’s great stillwater fisheries. Huge trout in the ten-pound range are not out of the question. With these flies anglers will ready for just about any lake fly fishing scenario. 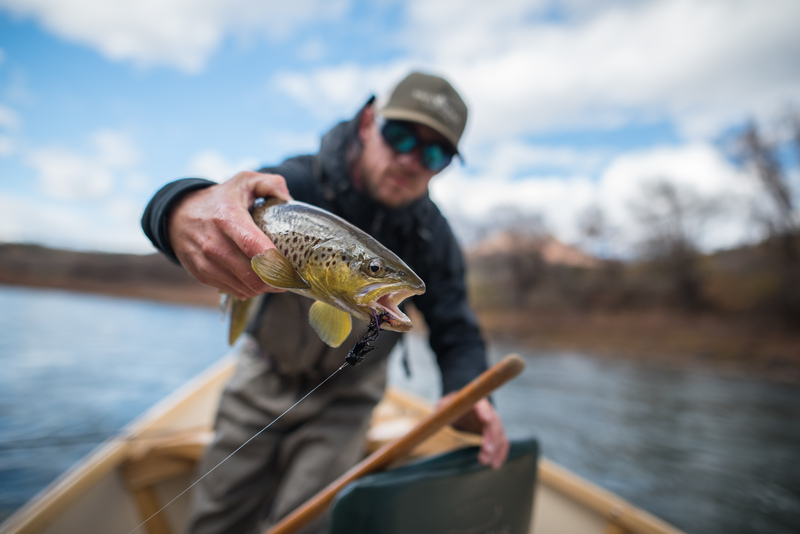 For more info on fly fishing Colorado lakes and choosing the best stillwater fly patterns, visit the Vail Valley Anglers fly shop in Edwards, Colorado.